Hello Castaways, this is Denise Crown. I have a story to tell you with a surprise ending. I recently treated myself to the water resistant AppleWatch 2. I love to swim, and really wanted to capture my swimming effort as part of my fitness history. This left me with my original Apple Watch to find a home for. I’m not a sentimental person, but I do get a little emotional over first generation Apple gear. I still have my original iPod and iPhone. In this case, I thought I would part with my original 38mm aluminum watch with white sport strap, so I started researching my options. I don’t deal with Craig’s list or eBay so one of the Castaways suggested the Amazon trade in program. I checked www.amazon.com/tradein and they offered $135 (US) for the watch. Because I am a fanatic about taking care of my Apple gear, I had the original paperwork, box, etc, so I lovingly packed it all up and shipped it off to Amazon. I actually felt a little pang of remorse the minute the box dropped into the UPS container. 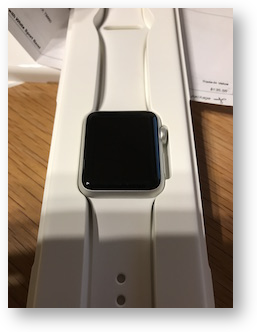 A week or so later, I got an email saying my pristine watch was REJECTED. Rejected! For minute scratches! I was MORTIFIED. I was DEVASTATED they thought my watch was scratched. Was I a terrible watch parent without even knowing it? Would I be banned from future trips to Apple? All of this seriously went through my head. I posted my shame and sadness to the Nosillacast group and many teary and mad emoji’s appeared on my post. You calmed me down, dear Castaways. Another week passes and the watch is returned to me…. WITH AN ENORMOUS STICKER OVER THE SERIAL NUMBER. I lost it. 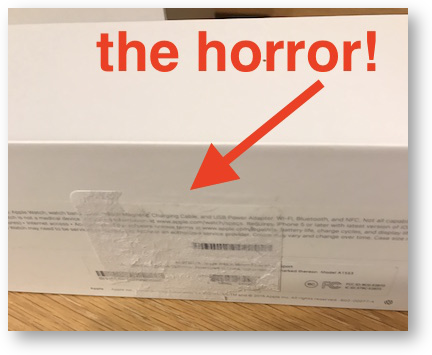 Who puts a sticker on a pristine 1st generation Apple box? Were they crazy? It was like disfiguring Venus! I know I’m NEVER getting an invite to Jony Ive’s Christmas party now. “I’ve been a customer for 16 years, and as my account will show, I spend too much money on things I do not need.” (I always try to go for humor, even cheap humor, in times of great stress.) I continued to tell him of the watch being returned, and me being unable to find any scratches, and then the horror of the package coming back with the sticker. I tried my best to be charming while voicing my disappointment over the whole sticker business. Today in my email, I find a note from Swetha Kota. Apparently, poor Swetha is tasked with reading these jeff@amazon emails. I hope you will keep dear Swetha in your thoughts. I imagine her to have the patience of a saint, and in fact I googled the Hindi meaning of Swetha and it means “bright” as in white light. She was certainly my white light as you are about to discover. She was terribly sorry for my inconvenience and was crediting my account for the $135 they offered me for the watch originally. In part she says “Rest assured, I shall tell the tradein team about the issue with stickers.” She totally gets me. Now I have the watch, and I have $135. My appreciation for Amazon is fully restored and my customer loyalty can never be in doubt. And now I’ve decided to find someone who wants to monitor their fitness and pay it forward by gifting the watch to someone who will benefit from it as much as I did. And the moral of the story is that some companies go above and beyond, and sometimes people will give you brilliant advice. To David Bender, an enormous thanks for a wonderful suggestion. May your hard drive ever spin and your iCloud always be in sync. Apologies for mispronouncing Swetha’s name in the audio.